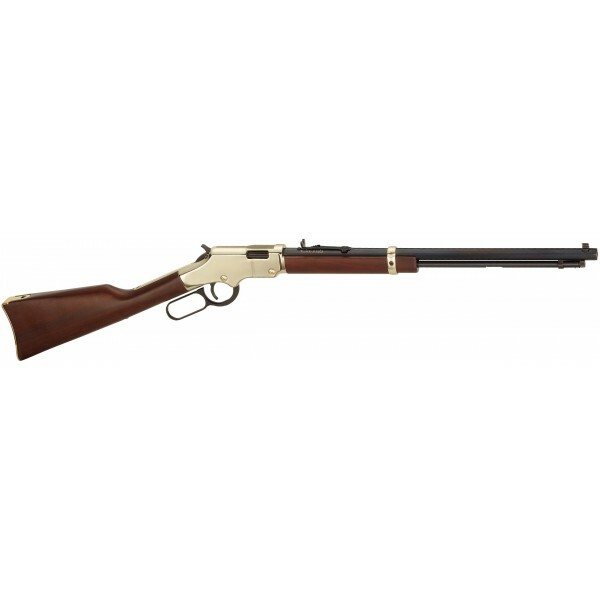 Henry Golden Boy 22LR Lever Action Rifle H004. Small game hunters and plinkers will appreciate its substantial 6¾ pound heft. It balances well and makes for highly accurate offhand shooting. The smooth action associated with Henry rifles opens and shuts with the effortless slickness lever-lovers long for. Get one in your hands and take aim. See what a natural pointer it really is. Adding to the historic authenticity is the adjustable buckhorn-type rear sight. The .22 LR version holds 16 rounds and will provide a whole lot of shooting pleasure before it’s time to reload their tubular magazines. Henry Golden Boy 22LR Lever Action Rifle H004. Whether you choose one chambered for .22 LR, .22 Magnum, or .17HMR, the Henry Golden Boy is a masterpiece of fine crafted gunsmithing. Any shooting enthusiast who closely examines one is immediately impressed with the excellent fit, finish and overall visually elegant design. The Golden Boy rifle’s awesome 20-inch blued octagonal barrel, American walnut stock, brass buttplate and gleaming Brasslite receiver will transport you back to the wild and wooley days of America’s Old West, when Benjamin Tyler Henry designed the original Henry lever action rifle. Small game hunters and plinkers will appreciate its substantial 6¾ pound heft. It balances well and makes for highly accurate offhand shooting. The smooth action associated with Henry rifles opens and shuts with the effortless slickness lever-lovers long for. Get one in your hands and take aim. See what a natural pointer it really is. Adding to the historic authenticity is the adjustable buckhorn-type rear sight. The .22 LR version holds 16 rounds and will provide a whole lot of shooting pleasure before it’s time to reload their tubular magazines.